(Regular) If a creature eats Sweet Roll, heal them. 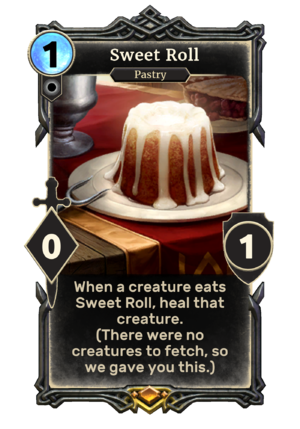 Sweet Roll is a legendary Neutral creature card. It has two variants, both of which are unobtainable. Playing this card will grant you the The Pastry Chef title. The alternative art Grisly Gourmet that could be obtained on the 14th, 15th, and 16th login rewards in February 2018, also creates an alternative art Sweet Roll. It is themed for Heart's Day, the Tamrielic equivalent to Valentine's Day. Mecinar formerly created a Sweet Roll of the second variety when a deck did not have any creatures in it. This was changed in September 2018. This page was last modified on 2 December 2018, at 05:34.